The problem with the privatisation of the NHS. Lucy Reynolds talks to Jill Mountford – YouTube. I have to constantly point out to people who use Daily Mail articles, to attack climate change and renewables. That the Daily Mail is a paper which only pushes untruths, not only about climate change but also on immigration, benefits, NHS and welfare. No one can really take this adult comic seriously. Dear Mail on Sunday, Time is not on your side | Greenpeace UK. The continued destruction of green space and mature trees in Manchester, by Manchester City Council is more than the act of the criminally insane. The Convention on Biological Diversity was established in 1992. Following a first meeting in Rio de Janeiro in 1994, the UK produced its first national biodiversity action plan. In 2002 world leaders agreed in Johannesburg on the urgent need to reduce the rate of loss of biodiversity by 2010, and in 2007 they recognised the need to take action to mitigate the impacts of climate change following the 2005 Millennium Ecosystem Assessment. As an investor in Triodos Renewables Fund, I decided to go to Bristol to attend the AGM (Annual General Meeting) of the fund. The meeting took place on Saturday, 15th June and had decide to spend the weekend in Bristol. This was my second AGM, I had attended, my first being two years ago when it was held at Ness Point, Lowestoft, site of one of the funds wind-turbines. That weekend was also the start of Bristol’s Big Green Week, which leaves Manchester’s green events in the shade. The Friday I arrived, it was announced that evening, that Bristol had been elected to be European Green Capital for 2015. 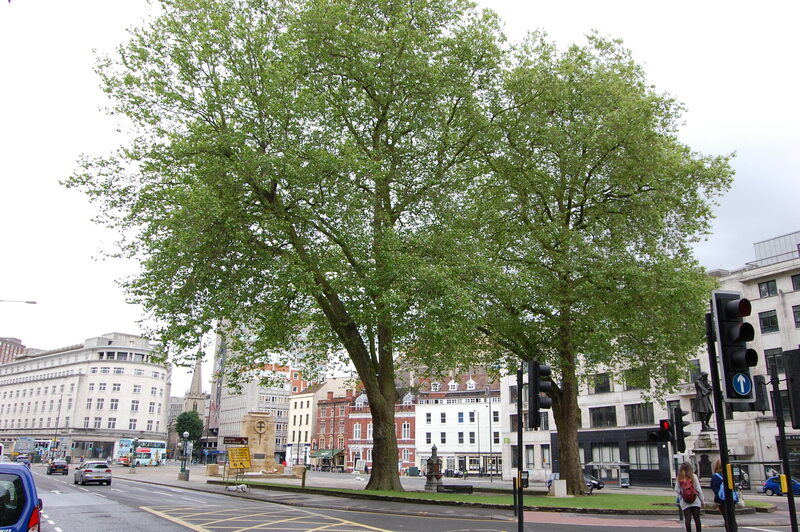 I did noticed their City Centre did seem cleaner and greener than Manchester City Centre, with plenty of mature trees still standing. View along St. Augustine’s Way, towards the Cenotaph. On the Saturday morning I made my way down to the Triodos Bank offices. I found the walk pleasant, not just because of the views but also of the pedestrian and cyclist friendly attitude of the motorists. 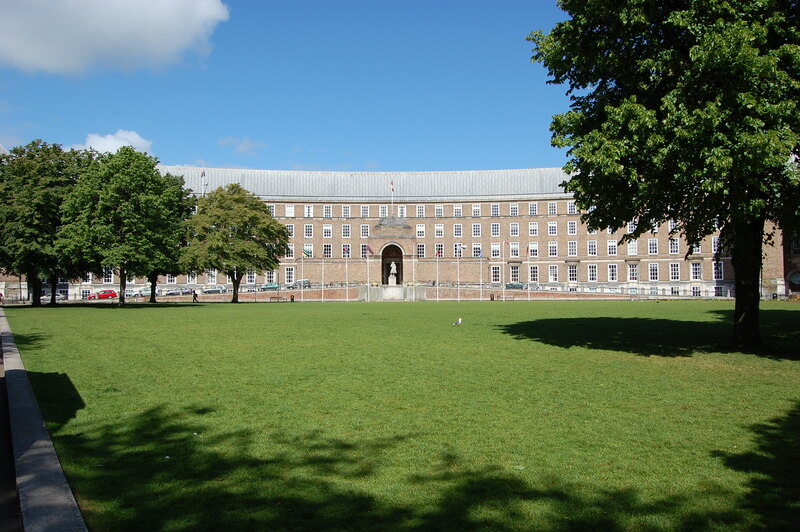 And the scene outside Bristol’s Council’s offices beats Manchester’s any time in my view. At Triodos’s offices we were informed they had solar PV in place on the roof and rainwater was harvested. Unfortunately, the EA (Environment Agency) had occupied the offices next door first and they were the beneficiaries of the harvested rainwater. After the main business of the AGM, we had a question and answer session. One of the questions was about opposition to wind-turbines. A member of the board, stated only one site had received any complaints, which was Kessingland, a site a visited two years ago. The complainant wrote, they could not see or hear the turbines, in fact knew nothing about them till they had read about them in the local paper. The board member did stress, that they still took this complaint seriously and took steps to mitigate any adverse impact. The Governments real intentions towards renewables, especially Eric Pickles stated support for those opposed to onshore wind. After lunch, we took a coach to Avonmouth and Wessex Water waste water treatment plant (sewage farm). After donning hard hats and high-vis, we assembled in a training room to be given a presentation by Mohammed Saddiq of GENeco. He explained the board of Wessex Water wanted to reduce their energy consumption and reduce their carbon footprint. Mohammed, stated GENeco was set up to explore the options, looking into energy efficiencies and into trying to be energy self-sufficient. You need to do both, to achieve the aim of reducing greenhouse gases and moving away from a fossil fuel economy. Originally the treated sludge waste from the sewage treatment plant, would be taken by local farmers, for a price. GENeco, decided to put this sewage sludge through a two-stage bio-digester to produce biogas. This left a rich compost which the company now sold to local farmers. In fact, the company employs a team soil biologists to advice farmers on exactly how much of this bio-fertiliser they need, to improve their soil. 220,000 tonnes a year are supplied by GENeco to farmers, as an alternative to fossil-fuel derived fertilisers. He did go on to mention a post-graduate working for them, who had suggested he could use the grits, rags and plastic instead of it going to landfill. The screenings as they are called are composted and used of remedial landscaping and the plastics separated out and sent to an energy-from-waste plant (I do not know which one and what process it uses). Their claim is they are zero waste, as no waste is sent to landfill. As well as sewage sludge being processed in the bio-digester plant, they now collect food waste and use this as well. The biogas is used in CHP plants to produce energy and heat. The heat is used to improve the efficiency of the plant and enough electricity is produced to be able to export some to the national grid. The even produce excess biogas, and have converted some of their vehicles to run on it,not just their promotional vehicle. 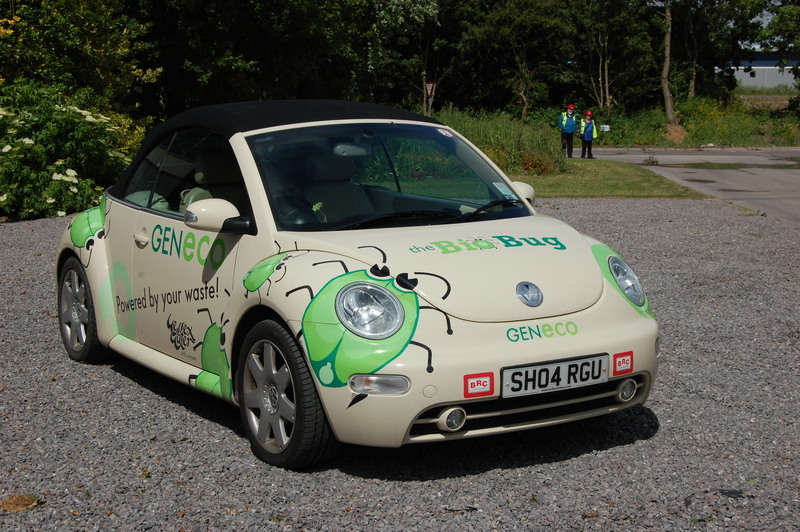 The Big Bug, biogas powered vehicle. They are producing 42 GWhr/year of electricity, exporting biogas, produce fertiliser and compost and even send treated waste water to a power station for use as cooling water. And all this was accomplished in 31/2 years. What has Manchester City Council accomplished since announcing it’s Manchester – A Certain Future, in December 2009? So why was Triodos Renewables investors here at Wessex Water waste water plant? During GENeco‘s review of options, they had applied for planning permission for 4 wind-turbines, that was approved. As, they were already energy sufficient, they had offered Triodos Renewables to chance to build and operate the wind-turbines. And that was the primary reason we were there, to look at the locations for our 4 new turbines. 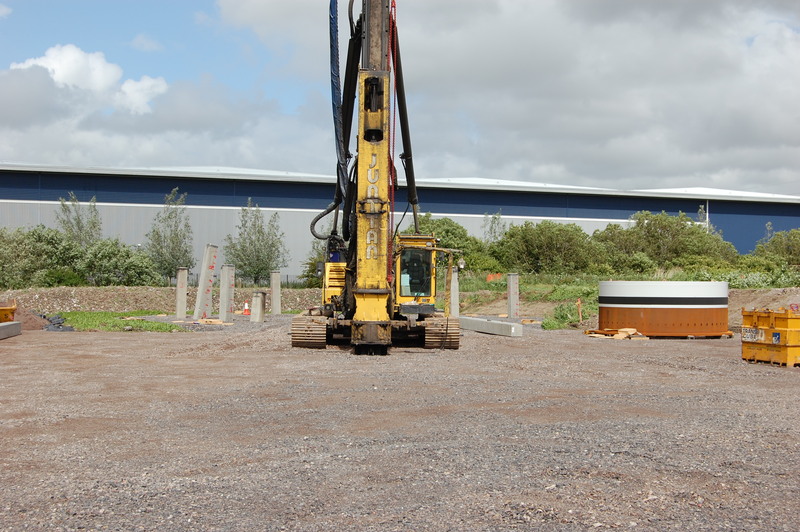 Pilings in place for Turbine 3 at Wessex Water, Avonmouth plant. 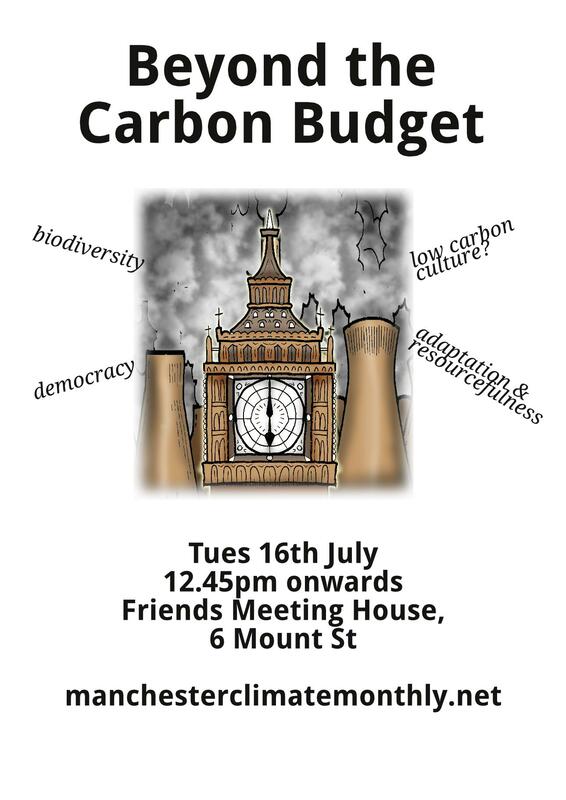 If only the UK Government bothered to factor in the true cost of carbon, then they would not be pushing the ‘dash for gas’ and ‘fracking’. The Obama administration just made a fairly significant move on climate change, and it flew right under the radar. To explain, let me back up a bit. Why does it matter? Because the U.S. government uses it to assess the costs and benefits of regulatory action. The higher the social cost of carbon, the more action can be economically justified. Specifically, regulations are assessed by the White House Office of Management and Budget (OMB). (There are reasons to lament that process, but put them aside for now.) The OMB runs cost-benefit analysis on every big regulation that issues from the executive branch. As well as the Oceans heating up, they also absorb carbon which turns them more acidic. This is causing the death of the corals and softening the shells of shellfish and crustaceans. Also, the Oceans may release to captured carbon back into the atmosphere. Evidence of climate change is all around us, manifesting in superstorms, wildfires, and melting ice. But temperature spikes recorded by weather stations over the past 15 years have been more muted than was previously the case, and lower than climate models had predicted. That’s leading many people to wonder: Is global warming less of a threat than we had feared? Climate scientists have been noting for years that the atmosphere is heating up less quickly than expected. Since last year, a growing number have been suggesting that we adjust our warming projections downward. Just last week, 17 scientists called for exactly that in a letter published in the journal Nature Geoscience; they wrote that their latest projections for rising temperatures remain “in agreement with earlier estimates, within the limits of uncertainty,” but at the lower end of that range. Biomass incineration is not clean, green or sustainable and now even safety of these plants are suspect. Biomass Industry Plays With Fire, Gets Burned [The Biomass Monitor] | Energy Justice Network.